I have a natural inclination for falafel. I was spoiled as a new hire at Big 4 Company when I worked in Boston’s financial district in the Spring of 2009. 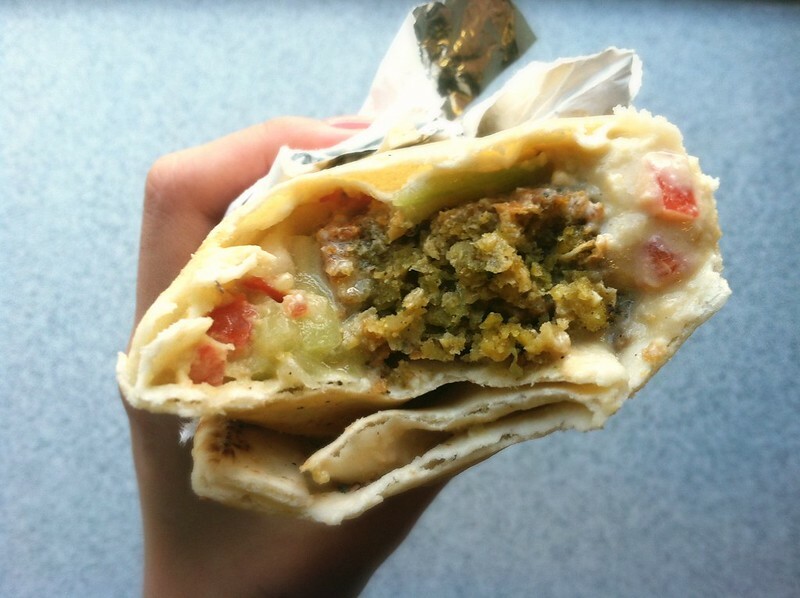 Falafel King is a hole in the wall that EVERYONE knows about. You stand in a gargantuan line, but the end result is you stuffing your belly with some deliciousness. A few weeks back, I had the opportunity to work in Boston. It’s a real luxury working from the office because I know where I am commuting to and from everyday and I have a nice structured schedule. That being said, I also have a lot more lunch options. 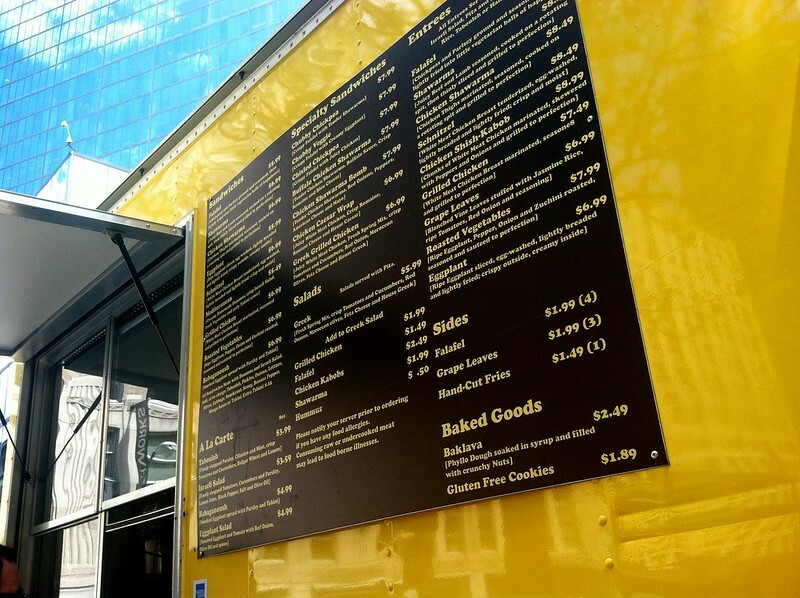 With the fairly recent food truck wave hitting Boston (the City only just gave the ok for food trucks not too long ago), there are designated food truck spots that have a nice rotation daily. 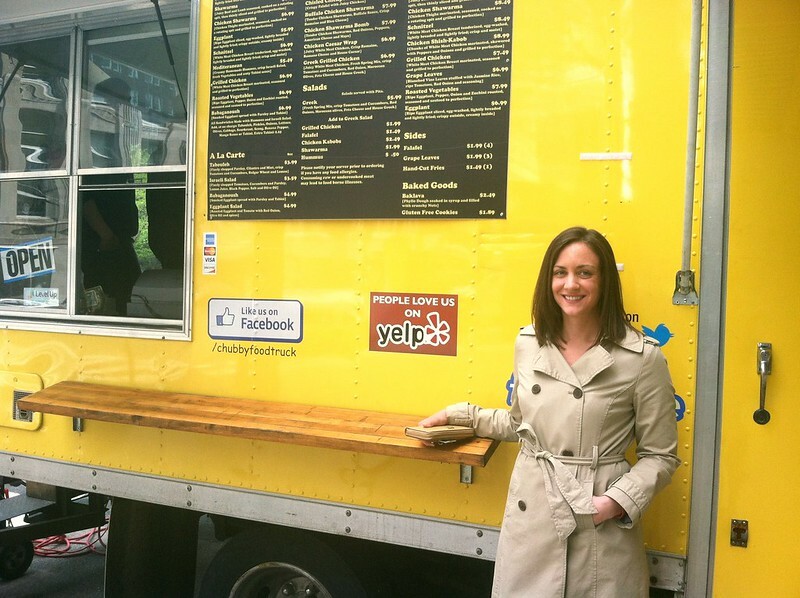 I’d seen the Chubby Chickpea truck before — it’s almost impossible to miss the big yellow truck, but I’d never actually stopped to sample some of its chickpea goodness. My friend Kate and I both ordered the falafel wrap, which was stuffed with veggies and warm hummus. It tasted distinctly of cucumber, so if that’s not a favorite flavor of yours, I’d kindly ask to take them out. If you love cucumber, you’ll be pleasantly surprised by how domineering the flavor is. The falafel was warm, held its shape nicely, and was not dry (be warned, the food truck has received mixed reviews on the consistency of its falafel ranging from perfect to way too dry). I really enjoyed my lunch that day, but perhaps it was because I got lucky. If I hadn’t read the reviews online, I would have never known about the moisture issues. 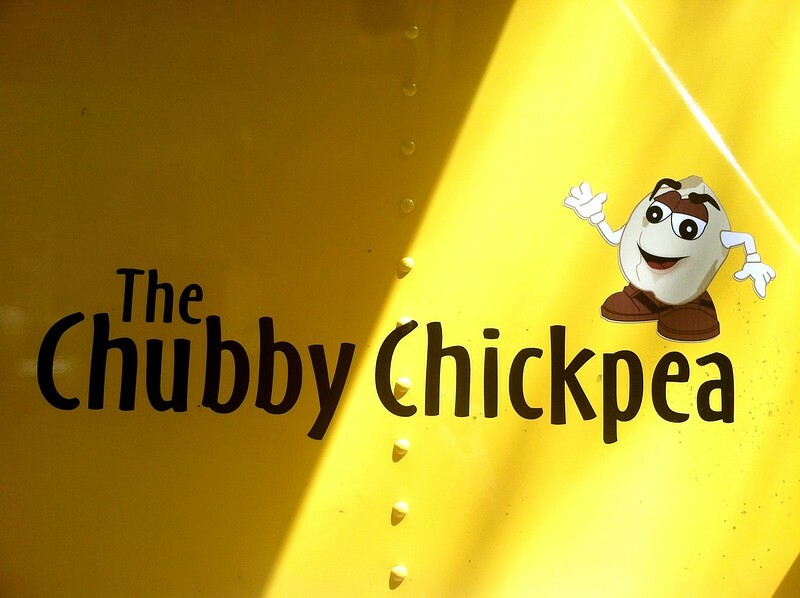 I wouldn’t go out of my way to get Chubby Chickpea again unless I’d already made my rounds with the other food truck options, but I’d definitely not refuse it if it swung by my apartment handing me a freebie. My only gripe about this “place” is its poor use of social media. Right now, they only have a Facebook page with 147 followers. I don’t mean to give parental advice without having children of my own, but social media seems pretty darn important if you’re a food truck. You want followers, buzz, and you want people to know where you’re going to be without them having to do some crazy search to find your schedule (like I just did to find the City of Boston link below). Why make it as difficult as possible for me to like/find you?